Vocational and trade education has played a significant role in the development of Alaska’s economy in recent years. In an effort to meet the growing need for skilled workers, the Alaska Department of Education and the Alaska Department of Labor jointly created a comprehensive plan to support and develop career and technical education training. With the labor and education departments working together, the state aims to promote career training programs that align with Alaska’s economic needs and growing career fields. This page helps prospective students learn more about the growing career fields and vocational and trade school opportunities in Alaska. Alaska's trade and vocational schools offer most areas of training a student could want, with a heavy focus on machinery and hospitality-related vocations. Students interested in vocational or trade education can look to their high school, a community college or a career college to study anything from diesel mechanics to hospitality services to medical assisting. In order to assist you in choosing a school, we have ranked all the accredited vocational and trade schools in Alaska based on student to teacher ratio, programs offered, length of programs and cost of attendance. For Alaskans, vocational and trade education can begin in high school. Alaska offers high schools exclusively for career and technical education (CTE) as well as CTE training in some of their traditional high schools. The University of Alaska system provides comprehensive postsecondary vocational and trade education, offering workforce training through their four-year universities and their related community campuses as well. Rural training centers and Alaska’s only accredited tribal college also offer vocational and trade education. 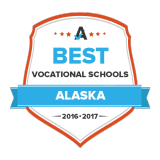 Students wanting to know more about specific vocational and trade schools in Alaska can use this search tool to help find the right school. From 2010-2014, Alaska has scored higher than the national average at the Technical Skill Attainment Core Indicator for secondary and postsecondary students. In the 2013-2014 school year, two-thirds of postsecondary vocational and trade students in Alaska were female. Alaska is home to Ilisagvik College, an Iñupiaq college that offers CTE associate degrees and the only college within the boundaries of the Arctic Slope. In the 2013-2014 school year, nearly twice as many Alaskan students were enrolled in secondary CTE programs than postsecondary CTE programs – 13,418 versus 7,006. Secondary students can apply for various levels of dual enrollment at all three University of Alaska campuses, allowing students who aren’t enrolled in CTE-specific high schools or programs to earn professional training and credentials. Alaska’s dual credit and articulation policies may explain why Alaska awards nearly twice as many one-year CTE certificates than the national average: not only can students earn one-year certificates in college, but they can do so even before graduating from high school. While the University of Alaska system offers traditional four-year degree programs related to vocational careers, prospective postsecondary CTE students can also earn associate degrees, one-year certificates and less-than-one-year certificates through University of Alaska’s community campuses, state workforce training programs, rural training centers and Alaska’s tribal college. Alaska’s most popular career cluster for CTE education—health science—also holds the most job openings in the state. Healthcare-related careers are on the rise due to Alaska’s aging population, expanded Medicaid eligibility and increased desire for medical services available in the Lower 48. Although architecture and construction are popular vocational education programs in Alaska, jobs in the industry are expected to decline as major projects that contributed to job growth in 2015 reach completion. While the need to transport construction materials may drop, Alaska is expecting increased tourism, so additional tourism-related transportation jobs should help offset the losses in construction transportation. Take a look at the table below to find out more about careers in Alaska with the most job openings for prospective employees with some college experience and those with associate degrees. The University of Alaska-Anchorage is classified as a four-year university, but within the university is the UAA Community and Technical College, where students can earn certificates, associate degrees and bachelor’s degrees. The college offers programs in seven divisions: aviation technology, computer and networking technology, construction, design and safety; culinary arts, hospitality and restaurant management, health, physical education and recreation; retail management, and transportation and power. The Alaska Career College, a two-year school in Anchorage offers less-than-one-year certificates, one-year certificates and associate degrees in aircraft dispatching, business, insurance coding and billing, medical assisting, phlebotomy and therapeutic massage. Through 2015, construction and oil-related jobs carried Anchorage’s economy and provided many job opportunities. However, low oil prices will likely cause a drop in oil-related jobs. While new oil and construction projects are expected in the future, these two industries are uncertain at the moment. As in the state as a whole, tourism and healthcare should see a significant rise in job opportunities from 2016 forward. Healthcare has traditionally provided the most job openings for Anchorage, and there aren’t signs of that changing. New hotels and restaurants in Anchorage, early flight bookings and increases in the cruise ship industry predict growth in hospitality, tourism and air travel-related fields, such as aircraft dispatching and air traffic control. Free education and career planning resource for Alaska residents. Create resumes and portfolios, learn about different occupations and creating learning and career plans. The hub for Alaska’s CTE information. Provides a variety of resources specific to CTE within the Alaska school system, like career clusters, school information, state plans and important dates. Links to the CTE school districts throughout the state. The body in charge of making and reviewing plans for training Alaska’s workforce. Informs readers of plans, policies and initiatives as well as job and training search resources. A program that supplies information and training to Alaskans seeking construction education. Includes programs for military members and women in trades, job outreach programs and pipeline construction programs. Provides an overview of career and technical education in Alaska, including enrollment information, education goals and available programs of study.